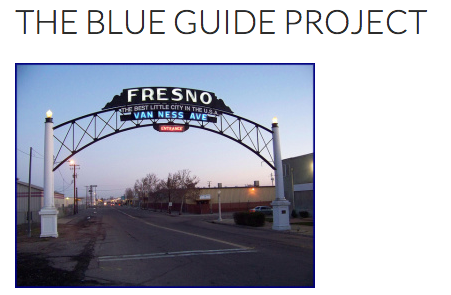 Assignment Guidelines: Using Michael Martone’s The Blue Guide to Indiana  as our model, we will be working together to create a Blue Guide to Fresno and the Central Valley. This means we will discuss how Martone’s book is written and for your mid-term project, you will be imitating the form and style of the book . Each member of the class will be required to contribute at least 3 entries to the project (approx. 750 words each), one of which must be “true” or “factual” (sort of like two lies and a truth ). The goal with the “true” one is to find a subject that someone could actually visit or look up, that could (at least in part) be “objectively verified,” but this doesn’t mean it can’t have some slippage between fact and fiction . Once completed the project will be “published” either in print (if we can figure out how to afford it) or online, and then shared with the public . Tips: Think about how you can use this assignment to essay or explore something unique about this place . Remember it doesn’t have to be fantastical or bizarre on the surface, but many apparently mundane subjects have fantastical or bizarre backstories. Think about the art of parody and satire as practiced by Martone, as well as his use of the absurd and the mundane. Pay attention as well to his use of specialized language. 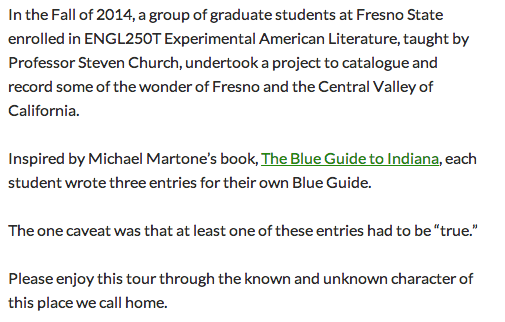 Click here to visit The Existential Van: The Blue Guide to Fresno! Previously to reading Martone’s book we read Reality Hunger: a Manifesto by David Shields and John D’Agata’s collection of essays, Halls of Fame; and we’d talked quite a bit about the collage form, the first person “eye” as opposed to “I,” “smuggling” reality into our work, and the idea of “wonder.” Wonder can be a noun, a place, a thing, but it is also a state of mind and of being in the world that is connected to curiosity, humility, and openness. In class we spent a great deal of time talking about what makes something sound factual or authoritative and, thereby, believable; and we discussed how the best satire and parody puts the reader in a state of uncertainty or “not-knowing,” at least for a while, and that this tension is often what drives the piece. The challenge, we discussed, was to both create and sustain this authentic tension, this kind of liminal space, as long as possible. Particularly with a subject such as Fresno, which is pretty easy to make fun of sarcastically and cynically, we talked about the challenge of creating “wonder” or “uncertainty” and sustaining the ironic tension without releasing the reader from the obligation to engage with the text on its own terms. We also talked about how Martone is able to “ape” a nonfiction form and style (the guide book) for fictional purposes, or he “smuggles” this bit of “reality” into his fiction. An interesting aside, perhaps: Martone was forced, by WW Norton, the publisher of the “real” Blue Guide travel guides, to include a “warning” label on the cover of the book, indicating that it is in no way related to the other Blue Guide and, “in no way factually depicts or accurately represents the State of Indiana,” except of course it does somehow. The book itself contains no such disclaimer or “pass” for the reader, which is often what I feel the ubiquitous “author’s note” in nonfiction books (and some novels) tends to accomplish—it absolves the reader of the responsibility of engaging with the text on its own terms. It gives the reader a “pass” to avoid some of the real risk and tension in the text. These kinds of author’s notes are, I believe, not only unnecessary much of the time, but actually detrimental to the reading experience. One of the more interesting examples of this occurred during our reading of (strangely enough) the novel, The Gangster We Are All Looking For, by Le Thi Diem Thuy, where the book written in a kind of shifting omniscient first person point of view that drifts into third person at times. Because of the “pass” given by this author’s note, her novel was read as “autobiographical,” and “like a memoir,” by several readers. In that note, she acknowledges some autobiographical material but emphasizes that the narrator, characters, and events are fictionalized. Unfortunately this only invited more speculation from some readers about what was or wasn’t autobiographical, questions that are completely irrelevant to the meaning in the book itself. Whether the events “actually happened,” doesn’t matter in the end; so the author’s note absolved some readers of talking about the book on its own terms, which is as a beautifully written, lyrical, associate and non-linear novel (NOT a memoir). One of my favorite “ice breaker” activities for the first night of any class, is the classic, “two truths and a lie,” where the students are limited to 3 sentences for each item and the goal is to make each one convincing and believable. Students are then asked to read their “two truths and a lie” and the class then votes on which one they think is the lie. In addition to learning interesting things about your classmates, the activity also leads into good discussion about what creates authority and believability in writing. Basically I’m asking the students here to come up with “two lies and a truth” about Fresno and the Central Valley. Not surprisingly, some of the most absurd and unbelievable entries were also the “true” ones (i.e. the Fresno County Landfill National Historic Site). We created a Wordpress site where we posted the entries, staggering them out a bit over time for maximum exposure. The name of the site comes from a statement I made in class about wanting to teach a class that meets every week in a van that I drive around Fresno. As I said before, Fresno is an easy place to make fun of; so the challenge here for the students was to change their lens, to see the place with wonder and curiosity, and to pay attention to the small moments of meaning, even transcendence, that surround them every day. Part of the assignment is to encourage students to be in tune to the sublime and ineffable, rather than the easy meanings we are spoon-fed. Click here for Emily Basiletti's interview with Michael Martone. Steven Church is the author of The Guinness Book of Me: a Memoir of Record, Theoretical Killings: Essays and Accidents, The Day After The Day After: My Atomic Angst, Ultrasonic: Essays (Lavender Ink) and a forthcoming book-length essay from Dzanc Books in 2016. 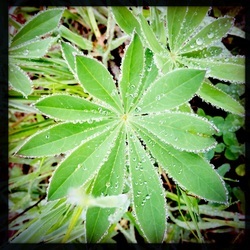 His essays have been published in Passages North, DIAGRAM, Brevity, River Teeth, The Rumpus, AGNI, The Pedestrian, Colorado Review, Creative Nonfiction, Terrain.org, and many others. He is a Founding Editor and Nonfiction Editor for the nationally recognized literary magazine, The Normal School; and he teaches in the MFA Program at Fresno State.